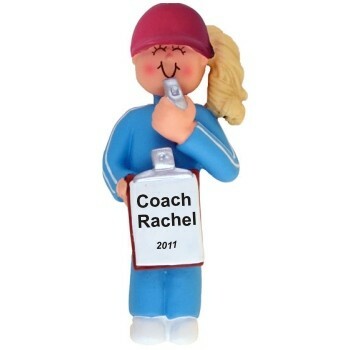 Express your admiration and appreciation to a wonderful person with the coach female blonde personalized Christmas ornament in a very stylish, cute design. We hand letter her name and the year onto the front of these sports ornaments personalized for lasting significance, and there's room on the back for an additional message. She'll be happy to receive the blonde woman coach personalized Christmas ornament that arrives in our custom velvet drawstring pouch.